A team of Australian archaeologists have uncovered a rare 2,000-year-old natural sea pearl, which they claim to be the first ever natural sea pearl found in Australia. The pearl was discovered during excavation work at historically important Brremangurey rockshelter, an isolated coastal Aboriginal site near the Kimberley's Admiralty Gulf in Western Australia. The team which found the unique pearl included archeologists and researchers from Wunambal-Gaambera Aboriginal Corporation, University of New England and University of Wollongong. Kat Szabo - who works as Associate Professor at the University of Wollongong and studies shells at archaeological sites – suggests that it is difficult to estimate the actual price of the pearl as this 2000-year-old pearl is rare and irreplaceable. "Natural pearls are very rare in nature and we certainly - despite many, many (oyster) shell middens being found in Australia - we've never found a natural pearl before." Kat Sazbo told AFP. "The location makes it particularly significant because the Kimberley coast of Australia is synonymous with pearling, and has been for the better part of the last century." The spherical pearl - pink and gold in color - has a diameter of five millimeter. A micro CT scan test revealed that it was a natural pearl rather than an artificially cultured pearl. The age was established through radiocarbon analysis. 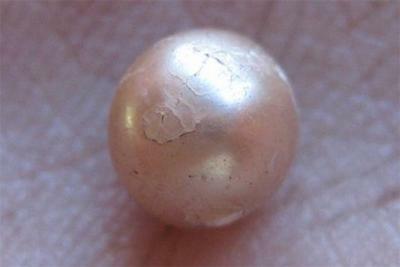 These non-destructive tests ensured that there was no damage to the pearl. The indigenous cultures in Australia had traditions of using oysters in rainmaking ceremonies. The shells of such oysters, which produce pearls, have been found in the central desert which is about 1,500 km away. "Studying the pearl has led us to the study of the layer in which it's found." Szabo said. The pearl will now be exhibited at Lustre Exhibition in the Western Australian Maritime Museum in Perth. The details of this discovery will also be published in the Australian Archaeology journal.